In a letter to Air India chief Rajiv Bansal, Chicago-based Vandana Jhingan says safety protocols were not followed after the incident. 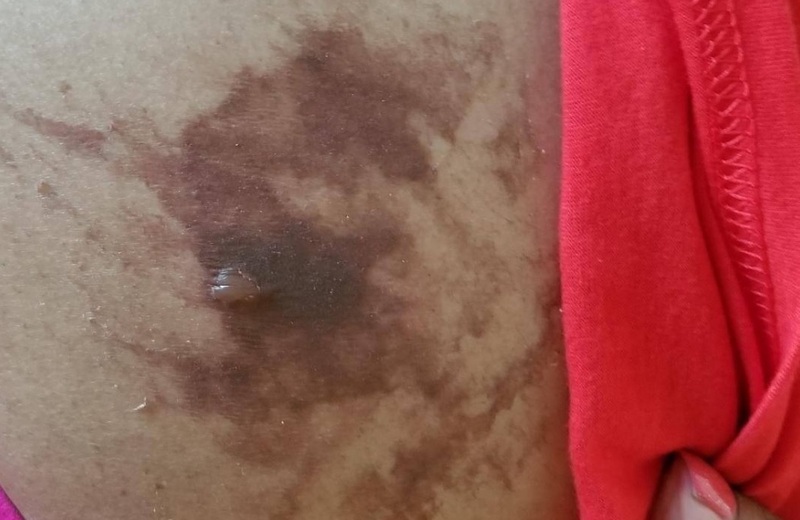 Chicago-based journalist Vandana Jhingan says she suffered severe burns when an Air India steward spilled a “full cup of very hot tea” on her abdomen. A copy of the letter is posted on the journalist’s Facebook wall. The Chicago resident boarded the flight from the O’Hare International Airport on September 27. Jhingan, who is the Midwest Bureau Chief of the Indian American cable network TV Asia, said the incident happened about two hours before the nonstop flight’s scheduled arrival in Delhi. She said she was fasting because of Navrātri opted only soft drinks and tea for in-flight food. Jhingan also wrote that safety protocols were also not followed after the incident. “Virtually most of the things that are necessary for safety of the passengers and those one expects to function in any long haul flights aren’t working on this flight – no established safety protocols for minor to major in-flight accidents and/or emergencies, no trained on-board airline staff nor off-board staff available for in-flight accidents and/or emergencies, no first aid kits on the plane, broken seats, non working USB ports, in-flight TVs are not working, toilets are not working, and the list of these lack of safety and non functioning items is long,” she wrote. Air India flies nonstop flights to India from five US cities: New York, Newark (NJ), Chicago, San Francisco and Washington. The last one from Washington to Delhi was launched in July. This is not the first time the beleaguered airline’s Chicago-Delhi flight has been in news for a wrong reason. In March, 12 toilets of a O’Hare bound flight became unusable. Four of them were not in service at the time of the takeoff. The flight had 340 passengers, many of whom were holding on to their full bladders and stomach when it landed in Chicago. I had the grave misfortune of boarding Air India, flight AI 126 from Chicago to Delhi on September 27, 2017 with a seat assignment of 34C. It was a grave mistake boarding AIR INDIA instead of any another airline. The whole episode speaks volumes of many things on why it is an avoidable horrible accident on AIR INDIA and an indelible scar for a life time. Virtually most of the things that are necessary for safety of the passengers and those one expects to function in any long haul flights aren’t working on this flight – no established safety protocols for minor to major in-flight accidents and/or emergencies, no trained on-board airline staff nor off-board staff available for in-flight accidents and/or emergencies, no first aid kits on the plane, broken seats, non working USB ports, in-flight TVs are not working, toilets are not working, and the list of these lack of safety and non functioning items is long. One can expect and get good safety and properly functioning things in most of the other international long haul carriers for much less price than I was charged by AIR INDIA. And it is just the beginning of this horrible avoidable story on AIR INDIA on that flight. Because of my Navrātri fasting (fasting for nine days before Dussera festival, which is on Sept 30, 2017) I opted only soft drinks and tea for my in-flight food. The non-stop flight is 14 ½ hrs long from Chicago to Delhi. About 2 hours before the flight’s scheduled arrival at Delhi, for the last in-flight food service I opted for tea. The in-flight server did not use a saucer with the very hot tea cup and he definitely didn’t use any common sense or appropriate steward training on how to serve hot drinks to in-flight passengers. He spilled this full cup of very hot tea on my abdomen while keeping it on the tray table. He said sorry and got ice. He indicated he can arrange for an ambulance as soon as the flight lands but I declined knowing the pathetic transport scene of ambulances in Delhi or anywhere in India. I told him that I need to see a doctor at the Air Port as soon as the plane lands. No doctor was arranged at the airport nor was any further help provided or offered by the in-flight staff before landing or after landing. No female steward ever came to see my burning and very painful injury nor could I see it myself in the in-flight bathroom (in the mirror one can only see upper body because of its height and location) though I could feel the severe burning and pain from the moment the very hot tea fell on my abdomen. There is no first aid box on the flight nor did I get any other help from any of the in-flight staff. I virtually had to drag myself off the plane as there was no help from the airline staff though I was in no condition to walk from the burn injury and deep pain. Immediately after getting off the plane I went into ladies bathroom where two maintenance women saw my badly burnt abdomen and from there they directed me to and I went to Air India Counter 2 and everyone was shocked to see my burnt abdomen and pale condition and they couldn’t comprehend the nonchalant and inhumane way my condition was ignored by the Air India flight staff up to that time. Mr. Paul Gomes (Duty Officer) and B D Banjar (OCS Air India) helped me to Medanta Hospital at the airport terminal. I was treated there. The only silver lining in this horrible episode were Mr. Gomes and Mr. Banjar. I am not a resident of India and am citizen of USA. I still have severe burning even after 48 hours of the horrible accident. Most importantly now I carry an indelible scar on my body and mind of this horrible and avoidable accident while not counting the costs of treatments, burden on myself and my family. My whole short trip to India is almost completely ruined. How is AIR INDIA going to even help me recoup my health and this wasted trip? What is AIR INDIA going to do to restore the wrong done to my body and life? How long it is going to take to do the above? I, my family and friends and the world are waiting to see your truthful answers and deeds. Pictures of this episode those are indicative of AIR INDIA’s apathy and inhumanness towards its passengers – (i) large area of burnt abdomen and (ii) burnt tissue peeling of from abdomen are attached with this. They are for you and the world to see and know how horrible travel by AIR INDIA is and can be. It is definitely one of the most shameless things for a national carrier and the nation whose façade is ‘Incredible India’. India’s PM Mr. Modi, instead of raising pompous and misleading slogan of ‘Make in India’ in Madison Square Garden, make sure its national carrier first gets its ‘safety and functionality’ in order so that there are no more victims like me before some one even lands in India. I know India has been world’s # 1 in bride burning and burn victims (from the days of Sati to burning by acids, kerosene, etc.) for several decades and still continues to be so. To that Mr. Modi probably wants AIR INDIA to add tea and coffee burning of foreign nationals. May be that is what he has on his mind when sloganeering ‘Make in India’.